When it comes to buying a home in Calgary, it’s becoming increasingly hard to come by spacious homes without a shocking price tag. Instead, many Calgarians are opting for a home in Boulder Creek Estates to find the space that matches their desire for relaxation and recreation without going beyond their financial limits. 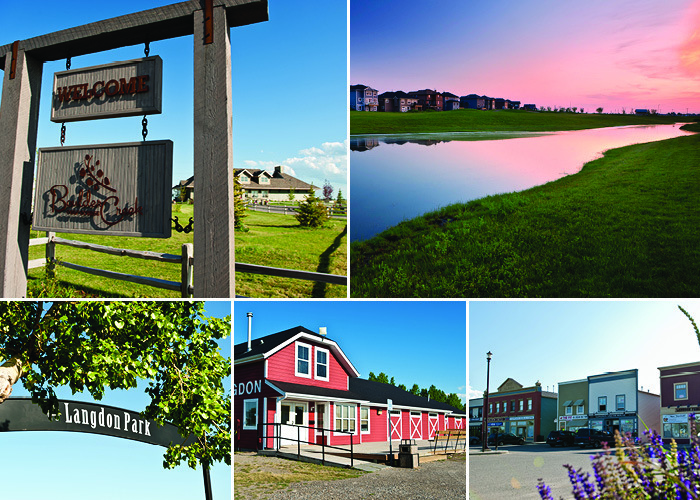 Boulder Creek is all about good neighbours, amenities, and golfing. Don’t let the city limits keep you and your lifestyle contained – live the bigger, boulder life that you deserve just 20 minutes from Calgary. Building in Boulder Creek means you’ll get a gorgeous estate home on a massive lot and have money left over to make it your own. Putting in a basketball court, a large garden or a pool are all possible when you’ve got both extra space and incredible value. And we aren’t kidding when we say gorgeous; Boulder Creeks’ architectural styles of Craftsman and Arts & Crafts draw extensively from Langdon’s pioneer beginnings. The expansive front porches, decorative stone and woodwork, dormer windows and open gable ends highlight an endearing streetscape anyone would love coming home to. The only thing better than one garage is three garages! Or, in the case of some Boulder Creek residents, four car garages! When you pay less for an estate lot in Boulder Creek there’s more left over for what you love to do. So go ahead, put in a workshop, bring your quads and forget about paying to store your RV offsite. Boulder Creek gives you the space – not to mention the 18-hole golf course – you need to live the fun parts of life to the fullest! Calling all golfers! Live the low-stress lifestyle that you want with the proximity to the golf course that you need. Relaxing in the tranquil atmosphere of Boulder Creek Golf Course makes your life here a hole-in-one. Keep active in the outdoors. Langdon is home to over 100 acres of parks and open spaces. Organized clubs, interconnected pathways, wildlife, and indoor amenities are all available to residents and visitors looking to appreciate the beautiful outdoor landscape. If you want the amenities of the city with the quaint charm of small-town living, Langdon is the community for you. Boulder Creek Estates brings comfortable luxury to this inviting and lovable town. See for yourself, you won’t want to leave! Pulling up to Langdon’s 1900s themed Main Street will instantly make you feel at home. You’ll also feel instantly compelled to stop for fresh baked bread or an ice cream cone! What you won’t find in Langdon are crowded stores, traffic jams, expensive parking or endless line-ups. Sometimes it's what a community doesn't have that makes it an ideal place to live. In case you were wondering, Langdon is home to Langdon School (grades K-9) and Sarah Thompson School (grades K-4). These charming country schools are modest in size, and have a real community feeling that centers on quality education for every student. Boulder Estates in Langdon allow you the space, luxury, and lifestyle that would cost you an arm and a leg in the city. Here you can have it all without having to drain your budget! Send a message to a to find out more about their homes, prices, and/or lot availability. By registering, you consent and their respective current and future affiliates and subsidiaries contacting you regarding their current and future products and services, event invitations, newsletters, announcements, promotions, incentives, and other publications. We respect your privacy. Your information will not be shared with any third party and you can unsubscribe at any time. * Due to new Canadian legislation, you will not receive further email communication from Live In Boulder Creek unless you provide consent.